Starting where we left off a couple weeks ago (Blackstone River North), we continued our walk along the Blackstone River Bikeway. The first mile or so of this walk is along a stretch of the bike path that is flanked by the railroad on the right and the river on the left. Most of it is fenced, but there are occasional trailheads that appear along the left. The Albion Dam soon appears on the river to the left. The water cascades over the dam then ripples downstream under the School Street Bridge. This is a good spot to relax and take in the scene. At the halfway point of this walk we crossed a bridge that spans the river. We were now entering Cumberland and the bike path climbs a small hill. There is some impressive looking ledge at this location. Soon we came to a railroad crossing where the bike path switches sides. Do not walk down the tracks. These are active tracks and occasionally a freight train will come rumbling through. We then continued along the bike path crossing under Interstate 295. About 2/10 of a mile after the interstate a path appears on the right. It leads to the river. Another path follows the river downstream pass the Ashton Dam. This path loops back to the bike path. We then continued south along the bike path crossing under the arched bridge that carries Route 116 over the Blackstone River. We then came to the Ashton Mill complex where we concluded this leg of the Blackstone River walk. Trail map can be found at: Blackstone River Central. 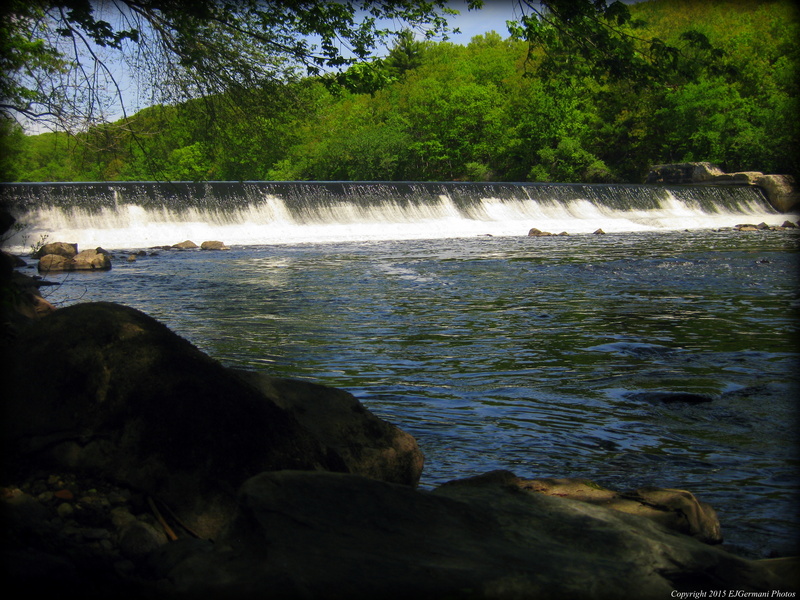 The Albion Dam Along The Blackstone River.